Today I got a telephone call from my neighbor when I was out in the car. 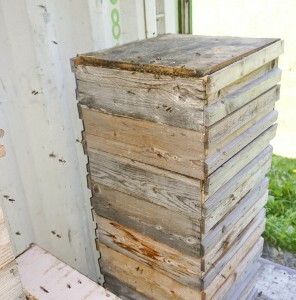 He told me a swarm was swirling in the air in his garden, then moving over my container for storing bee equipment. When I got home I went to the container. The door is almost always open to avoid overheating and too much moisture in it. Close to the opening I hade piled up some boxes with combs to be sorted out. Most of them would go to the solar wax melter, moldy pollen, bee feces, badly drawn, etc. The swarm had smelled the nice odor from the pile and sat on the outside trying to get it, without success. 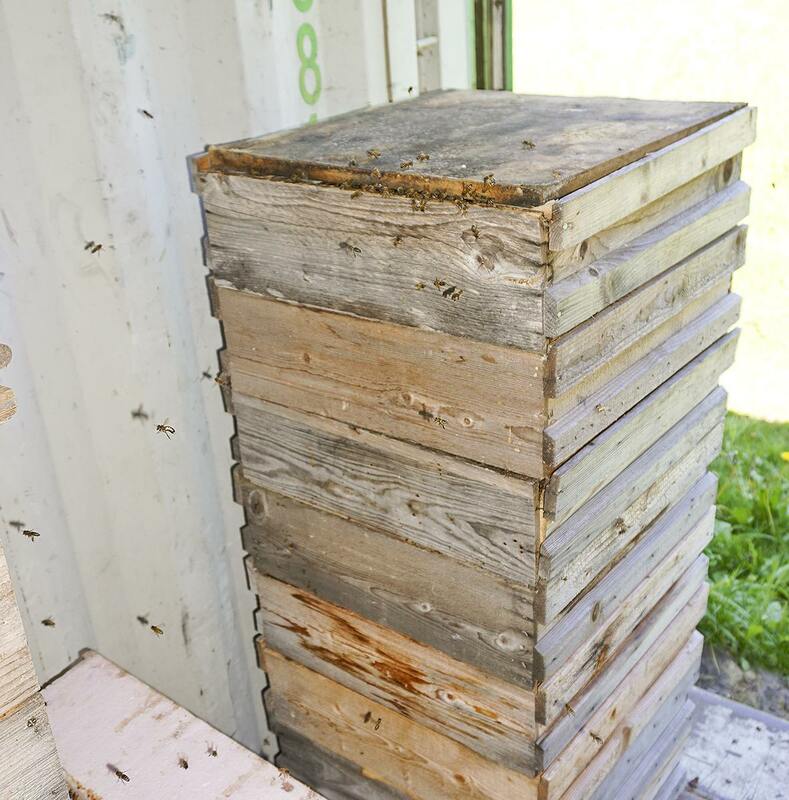 I stood looking at them shaking my head and told them in the world they had went to a closed pile of garbage combs and not to the nice swarm trap hive on the top of the container. I hadn’t gone looking at the swarm trap yet. As I stood talking to them about their bad choice, I got a feeling they asked me to open up the pile so they could walk in and they would clean my garbage combs for me. Well, I thought and remembered my friend who told me about the swarm that entered a failing colony hive in which the forest ants were building an anthill in one corner. The swarm just threw out everything in that hive and cleaned and secured it from the enemies. Inside the container looking out. The swarm have went in through the top entrance I gave them. A couple of weeks I will talk to them every time pass them. At that time I will open it to see if they have laying queen and decide how many boxes I will move to another yard to set up the new colony with old crap combs. 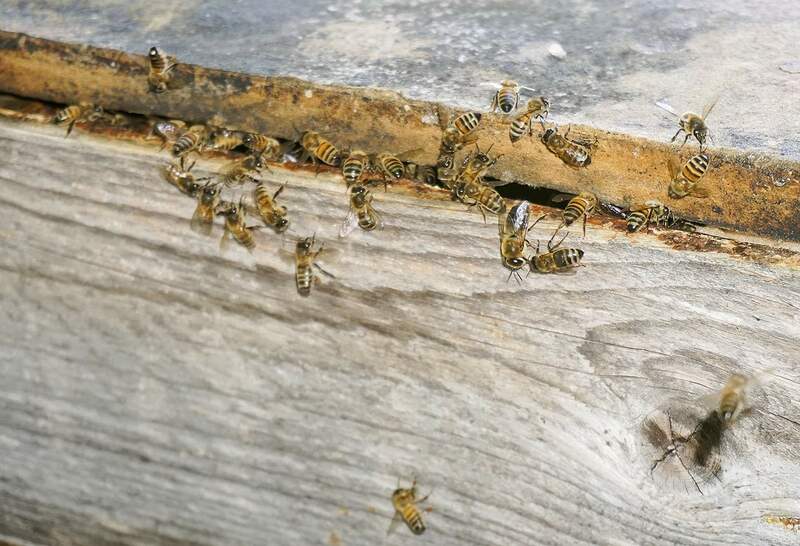 Poor bees, but they choose them themselves. So I opened the top lid of the pile just enough for the bees to enter. And they all went in happily. They thus got a top entrance. It will be interesting to see if they will keep what they promised. The top entrance of the pile of crap combs. Then I went to the swarm trap. Well, well, well. Bees were going in and out there. I thought it was bees from the swarm that were looking for a new home when they couldn’t get in the pile. I almost thought it was a mistake now opening up for the pile bees. Maybe they had went to the swarm trap if I hadn’t. But how should I have known? Scout bees looking at a house top flat. evidently I stopped them from moving in. I went to the solar melter to change combs. I had another pile with already sorted combs to melt. Then I saw A second swarm coming out of a hive. Maybe a second swarm from the same hive. No other though in my yard had swarmed. Many times swarms from other yards seek their new home close to a foreign yard. Good for the mixture of genes maybe. I had the garden hose handy close by and watered the swarming hive. The swarm went back. 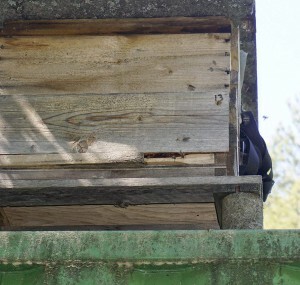 And the bees from the swarm trap disappeared. They were evidently scout bees from this swarming hive. Well, well, well. Did I do wrong again, or did I do right again. We’ll see tomorrow if this hive will swarm tomorrow again. This entry was posted in Swarm, Wax and tagged swarm trap by Erik. Bookmark the permalink.